I really love it when I get to come back to a restaurant I didn't have a great first experience at because I get to confirm whether or not I was just a tad unlucky the first time around or something's really wrong about it (although I am usually very reluctant). And, Plank might be the best example for this so far. Their newest pizza bundles were the first ones we got to try. 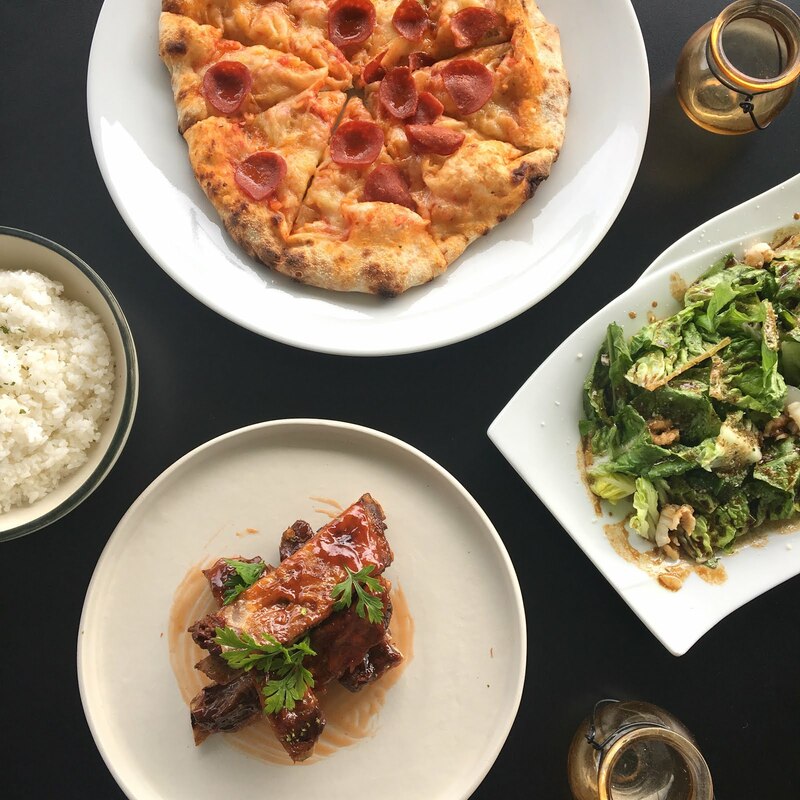 The first pizza bundle includes Pizza #0 (Red Sauce Mozzarella Pepperoni), Lychee Walnut Salad, 4 bones ribs and rice. The second pizza bundle includes their hawaiian pizza, 3pc chicken and lasagna. Okay, both were pretty good deals to me because I liked the items from both the bundles a lot. It's only now that I got to appreciate the difference of using sourdough in pizzas, as the slight sourness adds a nice contrast to the usually salty pizzas. My favorite pizza would be the Hawaiian, primarily because it's waaaay different from the cheap Hawaiian pizzas we are used to, and the arugula plus the different types of cheese used tasted all so good together. The ribs are also worth the praises because of its tenderness, and amazing flavor. Their chicken was what everyone else was fuzzing about because of its delicious herby flavor. The meaty deals were what surprised me most about this visit because this is their newest product, so it's the first time I encountered them. To tell you honestly, I didn't think that I'd like these at first. I was more excited about the pizzas, since it is what Plank is known for, but boy I was wrong. Each of these rice meals were delicious! Not only did they look gorgeous, but they were all cooked and seasoned perfectly. My palate is very much satisfied with my return to Plank. I would definitely be back with my colleagues for their bundles. I think it will be an hour of lunch break well spent.